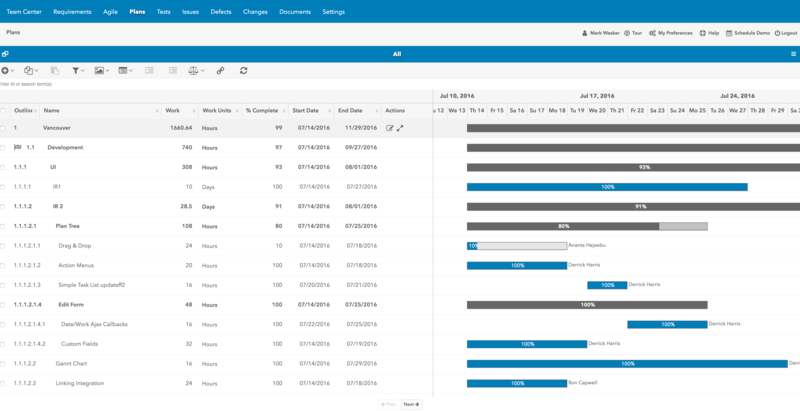 View and search all resources by work assignments, reservations, skills, projects, time periods, billable, non-billable - by any criteria you require. 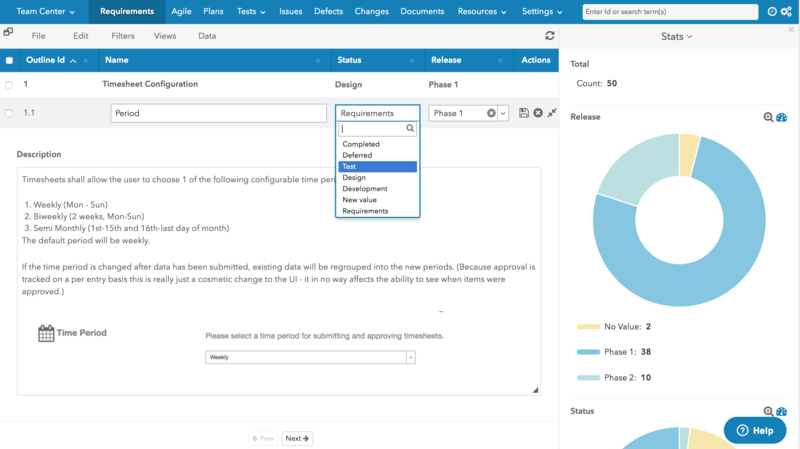 Compare actuals to planned, variances between reservations and assigned work, and even filter based on specified availability criteria. 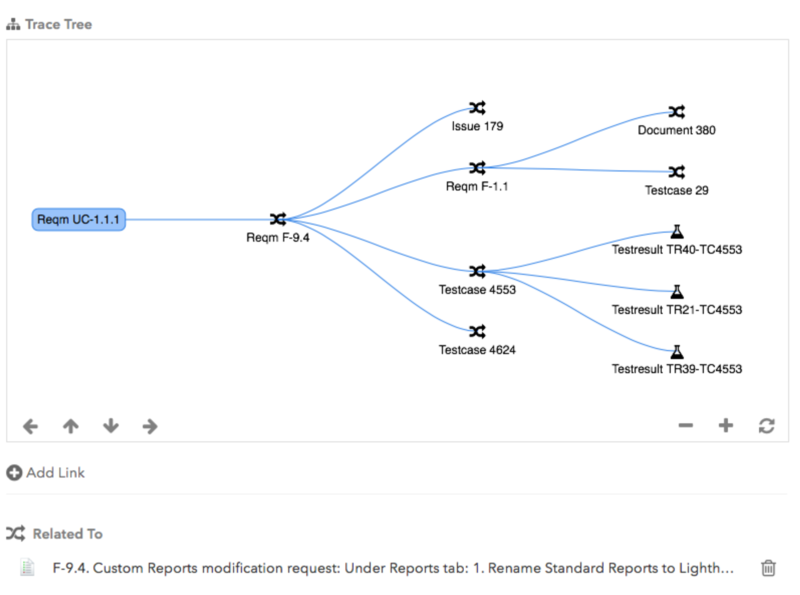 All the resource data you need in a single easy-to-use view. Book actual resources to specific projects to ensure those resources are available when the project actually commences. Workspace automatically displays resources available that meet any specified requirements, from skills to availability. All resource assignments are accessible right from the Resources app. 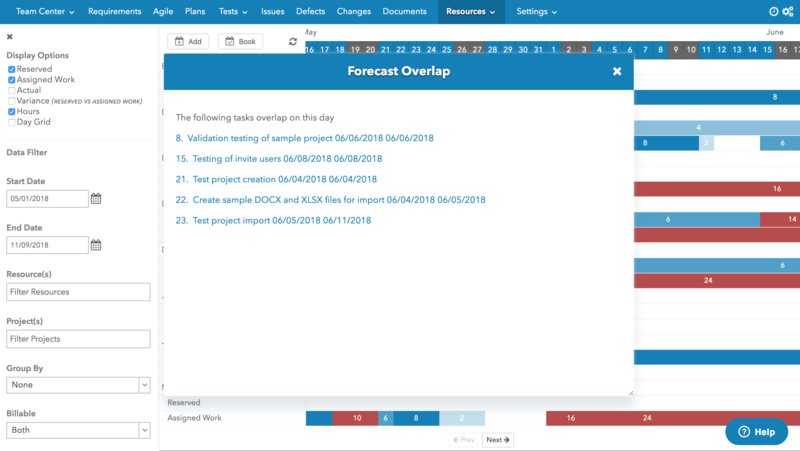 Just click on any item in the Gantt chart, and all tasks are displayed. 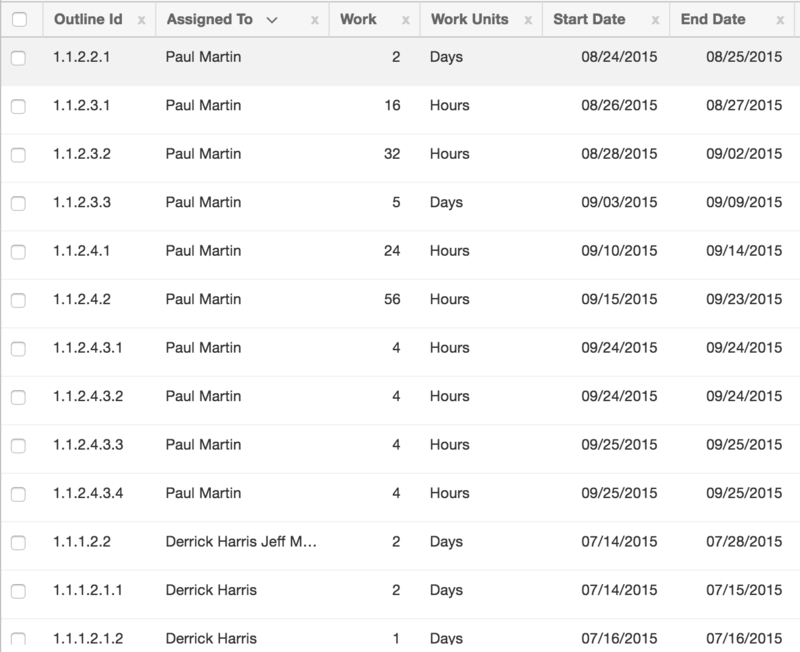 Click a task name, and drill down into the actual details. 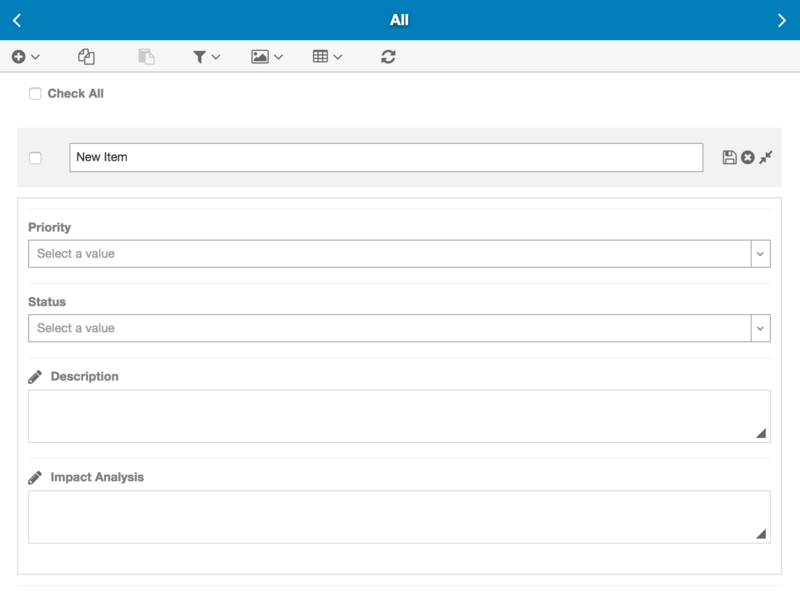 Workspace provides complete access to all resource data in one simple to use interface. 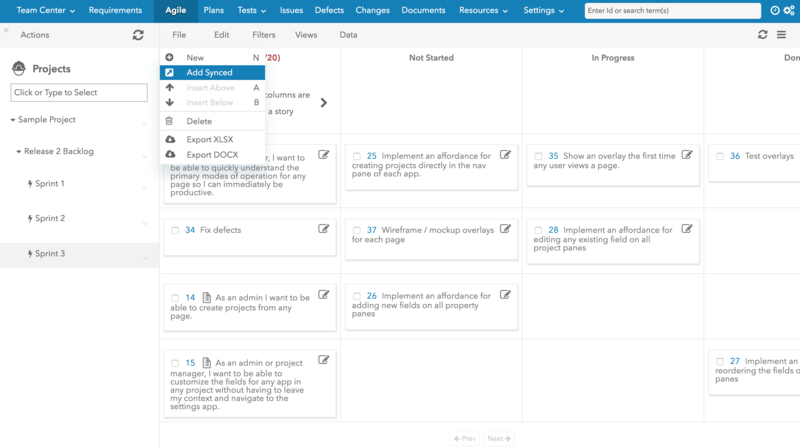 The taskboard tracks tasks assigned to stories, with a view of any combination of agile charts. 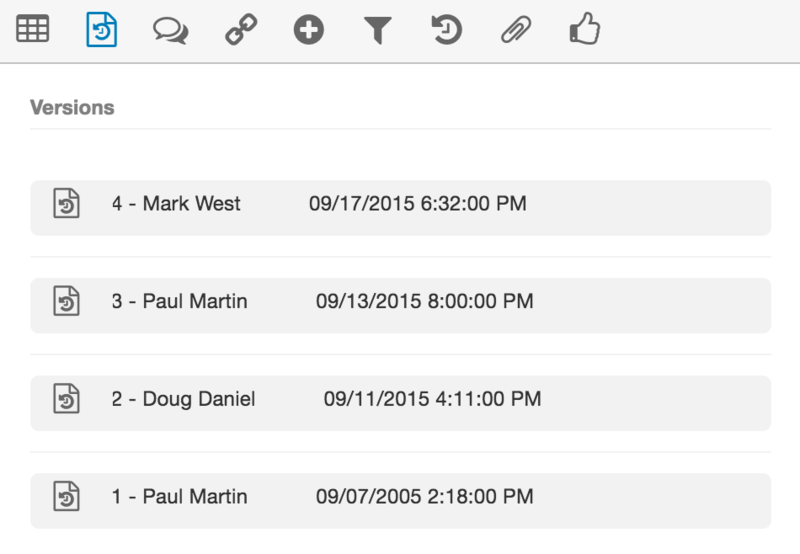 Drag and drop cards to assign to stories, or change status, and track capacity all in a single, easy to use view. 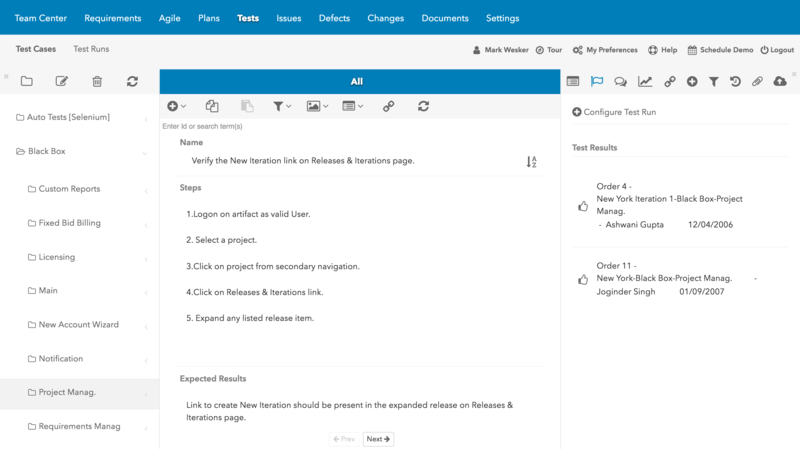 Sync items from any of the Workspace Apps to the Agile Taskboard. 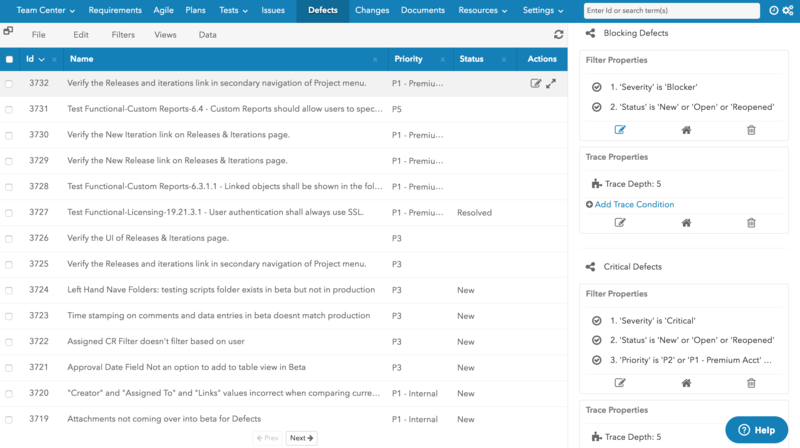 Create backlogs, epics and sprints without having to create new stories and tasks. Just add the existing items, and your ready to go. 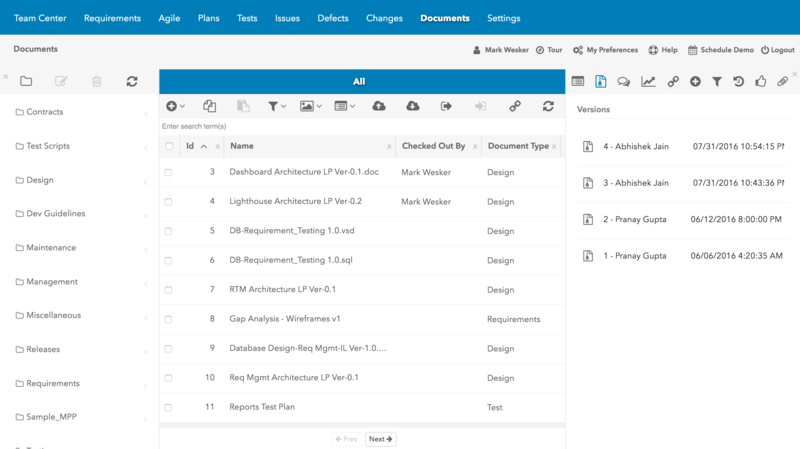 Select items from any of Workspace's apps to add to the Agile Taskboard, such as defects, test runs, or requirements. 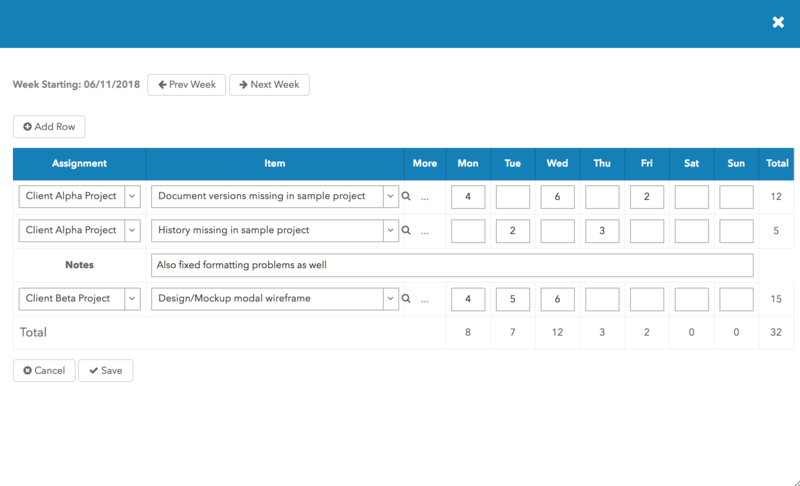 Items added to the taskboard have dual properties, both as tasks/stories and the properties of the orginiting item, such as a defect. 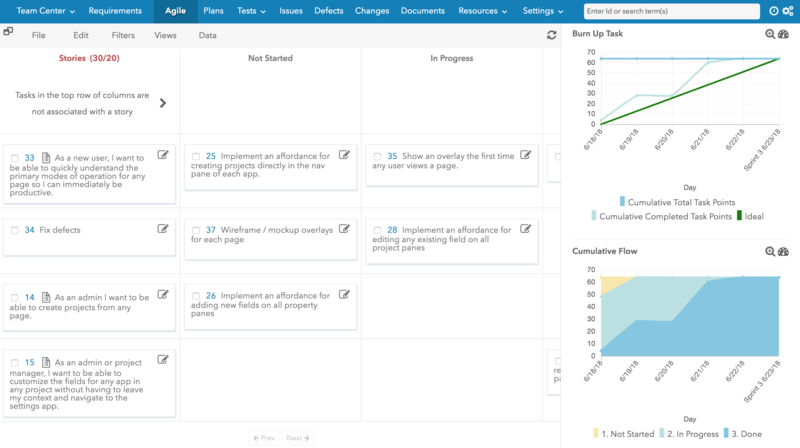 Workspace's Agile app includes a variety of agile stats and charts. Measure burn ups or burn downs on stories and tasks. Measure velocity and throughput. 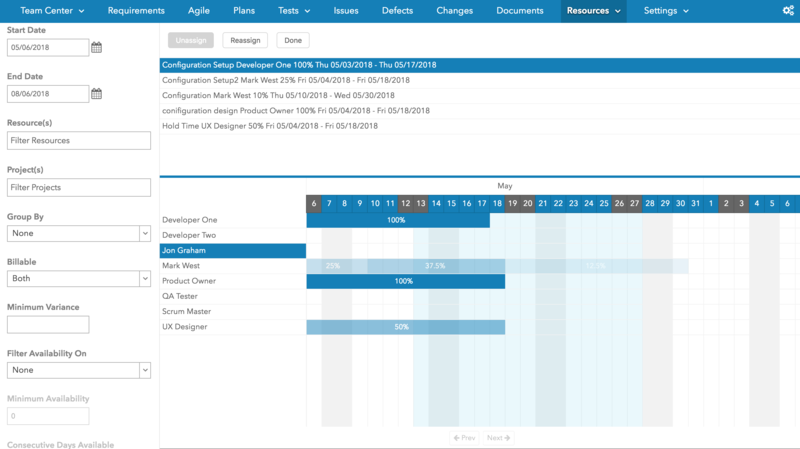 Teams have instant visibility into the entire agile process. 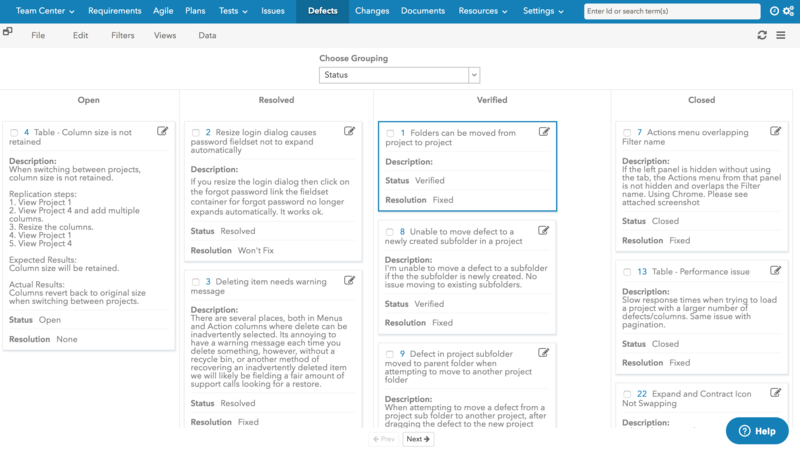 Choose from Scrum, Kanban and Scrumban to fit a project's needs. 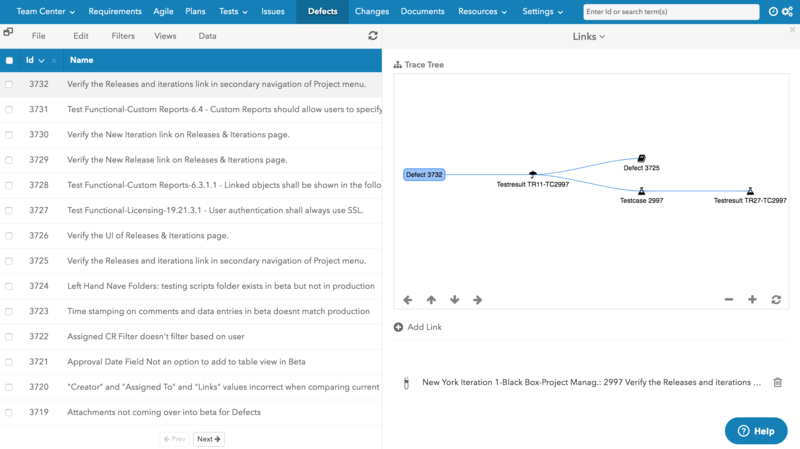 With Workspace, select the process to fit the project. Even sprints can have different agile processes within a project. 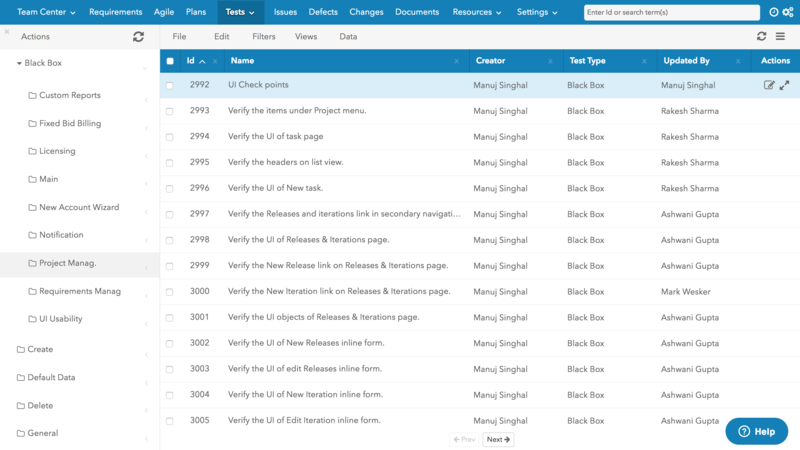 Create, view and edit requirements in a single, easy-to-use view. 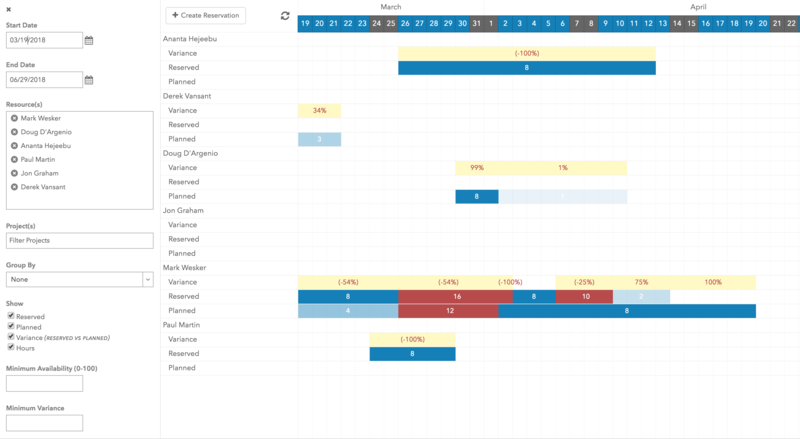 Stats can and analyzed using Workspace's built-in charts. 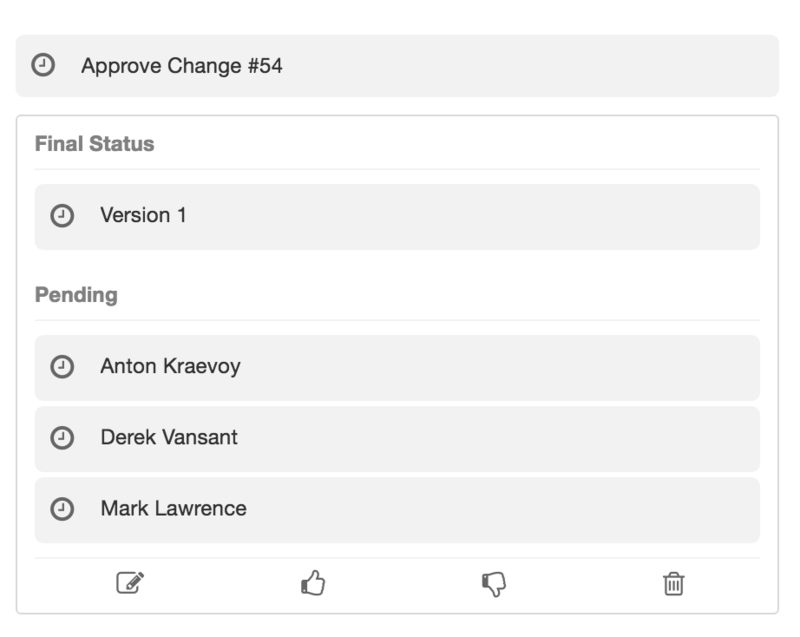 Click on the chart's dashboard icon, and add any chart to your Team Center dashboard. Requirements may be collected and managed in specific documents. 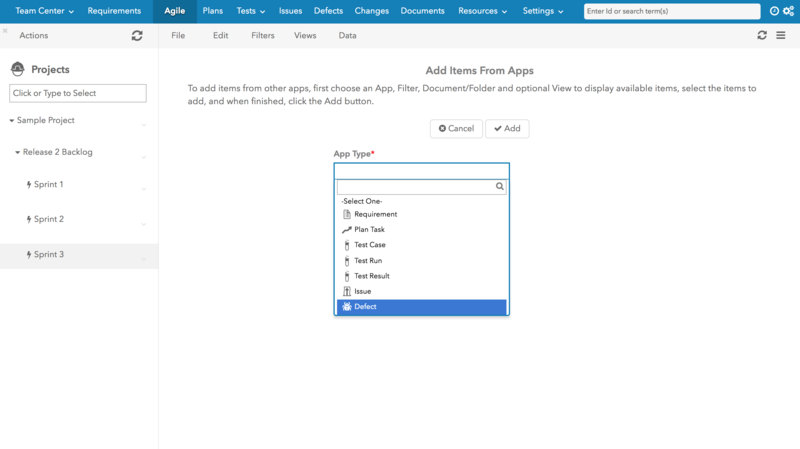 Create different documents for different requirement types or combine all requirements in a single document, and filter based on types. Workspace gives you many options when it comes to managing project requirements. Requirements may be linked to other requirements or items in other Workspace apps such as Test Cases, Change Requests, or Tasks. Trace a requirement to the Test Cases testing it, the Test Results produced from the Test Cases, and any Defects created from a failed Test Result. Workspace Traceability ensures that a complete audit of Requirements can be validated with just a few clicks, not the hours and days typically required. 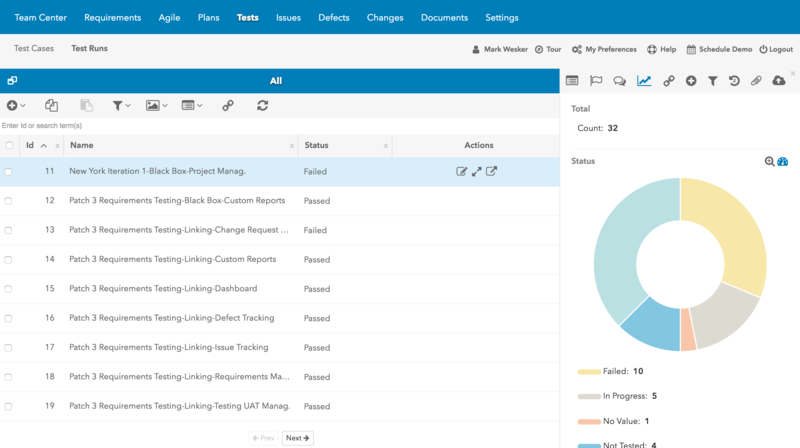 A complete solution for tracking and fixing defects. Don't let project defects bug you. 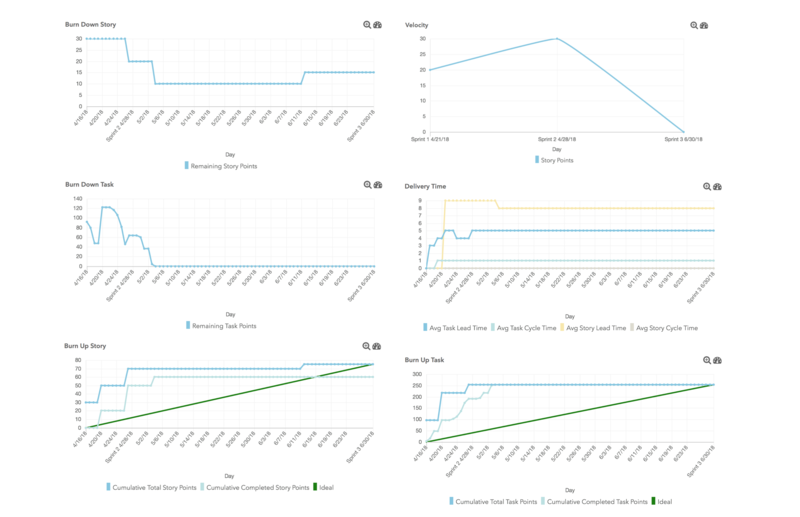 Workspace Stats are always available on any defect data being tracked. 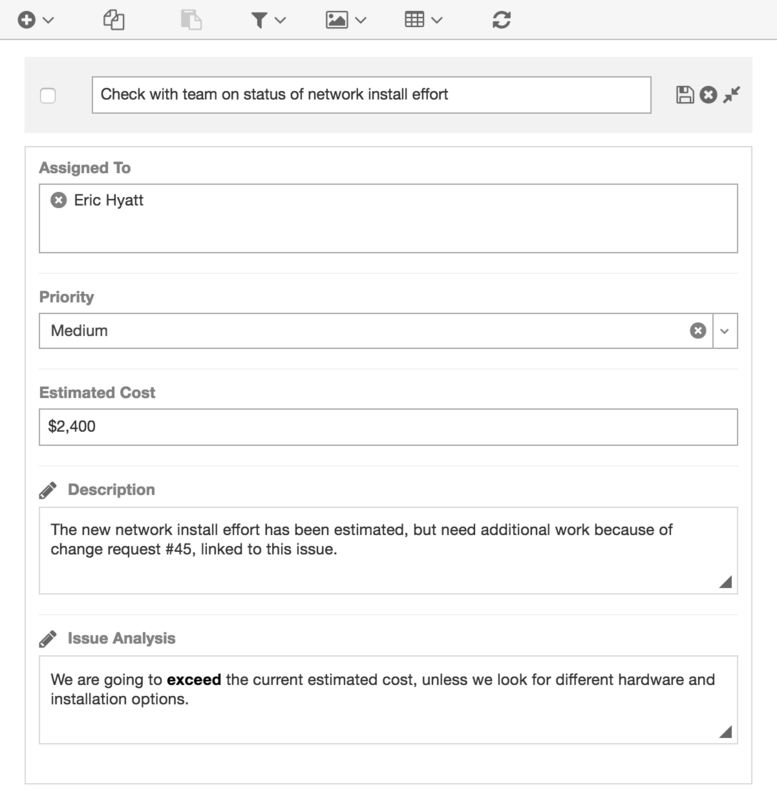 Views stats on Status, Resolution, Priority or any defect data you decide to configure. If you want to add a chart to your Dashboard, just click on the chart's dashboard icon, and it's automatically added to your personalized Team Center dashboard. 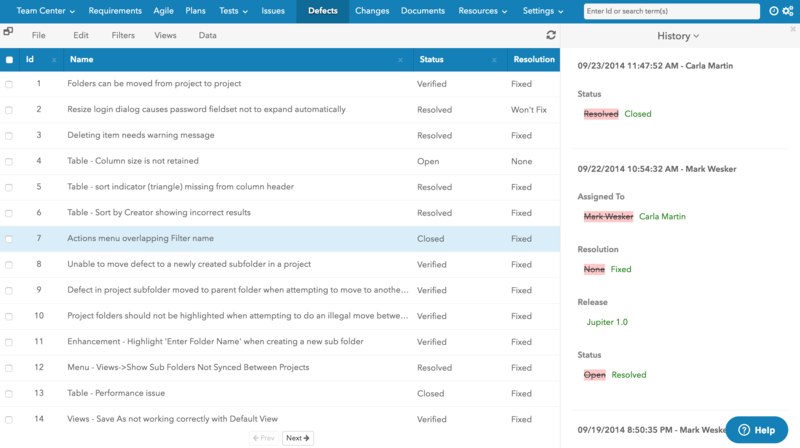 Workspace makes it simple to see all changes to a defect, who made the change, and when the change was made. No more trying to track down what is different, or why a fixed defect is now reopened. When you know what's happened, it so much easier to know what to do. Workspace provides various viewing options such as tables, lists or cards. If a card view is preferred, you can choose how to group the cards. Cards can be grouped by any configured fields. Cards can be edited inline, or use drag-and-drop to move the card to different value on the board. Discussion threads are available for each indivdual defect, so comments are maintained in context to the defect being worked on. No more searching through emails or instant messages for a particular discussion thread. With Workspace the discussion is always in context to the defect. Add to the discussion by posting a message from any device. 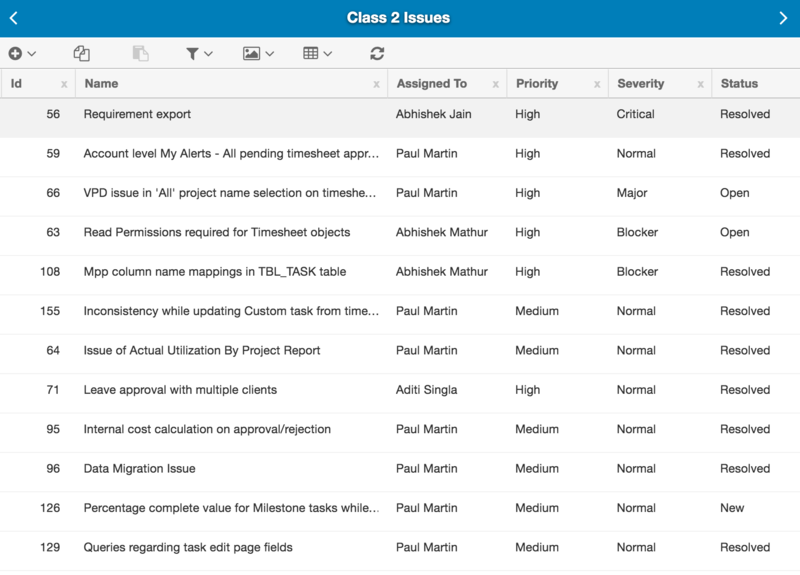 Fix defects fast by having instant access to all relevant information. 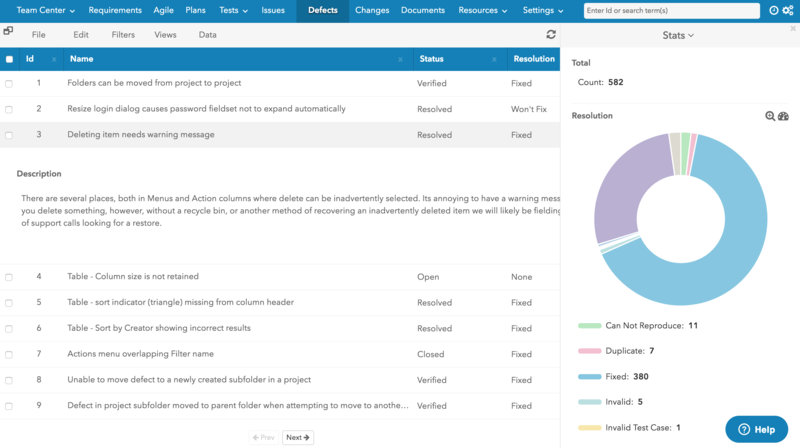 With Workspace traceability, you can instantly view the Test Result that produced the defect, the Test Case that produced the Test Result, and the Requirement(s) being tested. Defects can also be linked to other defects to make it easy to see related information. Workspace filters are a powerful tool to help you pick and choose just the information you need. Create a library of reusable test cases. Test cases may be organized in folders, and organized by type of testing, or any other necessary criteria. Test cases may be reused for each instance of testing in defined Test Runs. 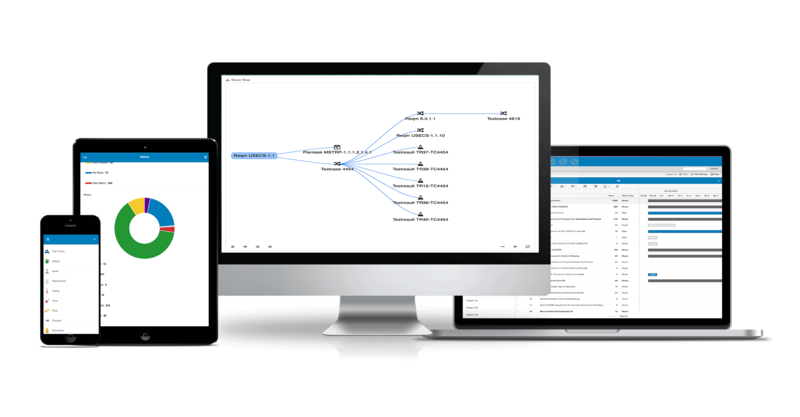 This enables test cases to be tested and retested, preserving the integrity of each test result. All test results for each test case are accessible, and include the Test Plan, Date of Testing, Testing Resource and Test Result. Testing metrics are automatically recorded and may be displayed as detailed charts. These charts also may be placed on Workspace Dashboards with a simple click. Testing metrics are available for any fields and values being tracked, including any custom fields created for the project.